Local attorney George West III is putting car dealerships on notice: Fully disclose all the items that go into the price of a car -- or face a jury. West's campaign to force franchised car dealers to adhere to state and federal disclosure laws has already netted him and his clients three settlements here, two with local Courtesy dealerships and one with Integrity Chrysler. Another two lawsuits are pending, one against Vista Chevrolet, the other against Fletcher Jones Toyota. Desert Auto Group's Marc Cannon says he agrees that some isolated incidents might merit closer scrutiny. For the most part, he says, providing customers with the highest quality of service is the only method that makes sense, not engaging in fraud. Attorneys such as West, Cannon said, don't want dealerships and customers to work to resolve any issues. "They want to find cases that pit people against each other." Fletcher Jones Mercedes (above) gets high marks from attorney George West for its disclosure policies. 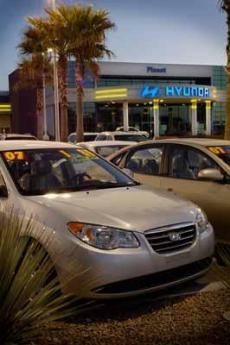 Dealerships can add thousands to a car's cost by not making all ancillary fees known to the consumer. West says what he's found among some dealerships in Southern Nevada is both widespread and easy to conceal. The pending local lawsuits are class actions, or are seeking class-action status, which could mean huge losses for the dealerships if West can prove to a jury that hundreds, if not thousands, of unwitting customers are financing cars with hidden fees attached. The practice of hiding fees in finance agreements, which by law are supposed to be itemized both for the bank doing the financing and for the customer, is widespread. West has filed similar cases in Arizona, Kentucky, Colorado, Utah and North Carolina, and he is affiliated with a nationwide network of attorneys and fraud experts who specifically target dealerships that fail to disclose additional costs for car buyers. "No matter where I go, it's non-disclosure of after-market products," he said. Dealerships make a killing not on actual car sales but on the extras they get buyers to agree to: extended mechanical warranties, service agreements, GAP insurance, the spray that seals a car's undercarriage, paint sealant and Scotchgard fabric protector. The only problem, West says, is banks don't finance most of these additions. Banks will finance GAP insurance, because if the car is totaled, the bank will get its money back. Banks will finance mechanical warranties, because they add value to the car. Banks do not finance paint sealants, nor do they finance fabric protectors. Car dealers know this, West says, and routinely add the price of after-market products to the vehicle's selling price, which can mean as much as $2,000 on the base price of a new car. Often that $2,000 pays for nothing more than a $40 car-wash contract, according to documents West provided to the Business Press. To independently verify West's claims, the Business Press contacted an ex-service employee at one of the valley's most prestigious foreign-car dealerships. The former employee said he recalls applying what many dealerships sell as "paint sealant" or a rust-prevention package. In this case, the product was called "Perma Plate," identified by a square sticker on a driver's window or windshield. This product costs consumers $1,100 each, the ex-employee says. It amounts to an agreement that every time a customer comes into the dealership for maintenance work, they get a full-detail job, including the application of "Perma Plate." This is supposedly done by a certified technician, but often falls to some of the lowest-ranking service employees, the ex-dealership worker says. "I used to do it. I ordered the stuff, too. It was car soap and spray-on wax." West's documents show that at many of the dealerships he's sued, the product cost dealers no more than $40, but cost consumers $1,800 or more. The financing contract consumers fill out often consists of one document, a Simple Interest Vehicle Contract & Security Agreement. On it are two areas for disclosure. One is the Federal Truth-in-Lending Act compliance form. The federal government requires lenders to detail the annual percentage rate being charged, finance charges, amount financed, total amount of payments and the total sales price. There is also a section for insurance purchases. Another disclosure area, Section C on most contracts, is the itemization form, in which all fees and products, including paint sealants, fabric protectors and ETCH, a theft-prevention product, are supposed to be spelled out. "It's lines one through five where consumers get screwed," West says, pointing to the relevant portion of a typical car-financing contract. "Dealers know no customer would pay cash for a $1,900 wax job that wears off in three months." Nevada Revised Statutes 97.299, 97.165 and 97.185 spell out for businesses exactly what disclosure is required, including, "the amount charged for a contract to service the vehicle after it's purchased." Often, dealers will "throw in" a service for free, telling customers that it comes with the car, thereby somehow avoiding disclosing the service. But once West has access to a car dealership's sales jacket, detailing all that went on during the sale, he says he often finds that portions of the car price have later been itemized for accounting reasons, diverting the monies spent by unwitting consumers into various accounts. West said the argument that dealers can orally agree to provide a "free" service is a fallacy and that not accounting for each item amounts to bank fraud. Nevada's law against deceptive trade practices, West says, is among the clearest in the country. "Nevada consumer law is the strongest of them all. It's very broad. Unfortunately, few attorneys here use it," he said. Among the documents provided by West include those being used to file a class action against Fletcher Jones Toyota. The dealership's attorney, Doug Gardner, did not wish to comment other than to say the case is technically not yet a class action suit. West says that's because it has not yet been certified as such by a local judge. In his time as a nationwide class-action attorney, no judge has ever refused to certify one of his cases, West says. Fletcher Jones' general manager did not return a phone call seeking comment. In this case, West plans to use a forensic accountant, an auto-fraud expert and the dealerships' own employees to make his case. Christine and Richard Kelley, Las Vegas residents, purchased a 2006 Toyota Scion on May 17, 2006, from Fletcher Jones. The vehicle's base price is listed as $18,594, according to the contract signed by the Kelleys. Added to this price was $435 in GAP insurance, $399 in documentation fees, $299 for the ETCH service (most banks won't finance ETCH, but in this case did), a $28.25 titling fee, $1,495.13 in sales tax and $1,100 for an extended-service contract. The total cash sales price ended up being $21,915. Not disclosed in the contract, but apparent in records in Richard Kelley's name, is a three-year warranty for paint protection from a company called Automate LLC. The Automate contract clearly shows Kelley's name, address, vehicle-identification number and odometer reading. What is conspicuously missing, both on the signed contract for the car and the original buyer's order form, is the price of the paint protection, called here the Desert Protection Package. West's records also indicate that the Kelleys signed a Toyota Financial Services Prepaid Maintenance Program Application, an agreement for regular maintenance at the dealership. Here, too, is all of the pertinent information about the car and purchaser, but no price. Also, nowhere in the original buyer's order or contract is there an itemized line about this maintenance agreement. The only slip of paper West has found so far to prove that these additional items exist is one from the salesman in this case, who had Richard Kelley sign a slip of paper saying that the maintenance contract consisted of two additions, "Add 1 year oil change, Add 3 year DPP (Desert Protection Package)." This case is typical, according to West. "These dealerships have been getting away with this for a long time." West said there are other dealerships in Las Vegas in his sights. "I have more work than I can handle," he said, not disclosing which dealers were next on his list. But, he also points out, his cases have led him to dealerships that comply with the rules. Among those he praises are Gaudin Ford, Pat Clark Pontiac and Fletcher Jones Mercedes. Cannon says there are many others here who rank among the good guys: "The majority of dealers do the right thing for their customers."